Capture the beauty of newly fallen leaves with our fall design bottle opener favors. A beautiful and useful gift for your guests, each metal bottle opener measures 3" x 1 1/4" and has a cut out copper color metal leaf perched atop a metal loop bottle opener. 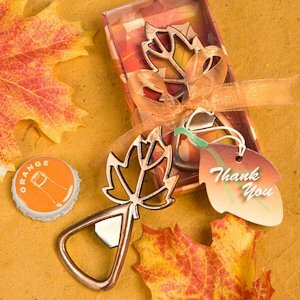 Each bottle opener comes in a clear topped box with a colorful fall leaf design base and then tied with a bronze organza ribbon with an attached leaf design "Thank You" tag. Hello. I was wondering if I can get a sample of a favor I am interested? Yes, you can get a sample of the Autumn Magic Leaf Design Bottle Openers at a special price of $0.73. Just enter 1 in the quantity box, add to cart then complete the check out.